I found this billhead on Ebay earlier this year, and I had to buy it. While its completely blank, it does offer additional information about the hotel, like the complimentary bus service. Its a beautiful piece of graphic design, with the flag on the roof line, the electric tram, and the sign for the Turkish bath on the side. I currently have two pieces from this hotel in my collection, a creamer and a butter pat. Wow, its been a long time since I posted anything and did an update with collecting finds. I plan to do some extreme updating, and pre-schedule some postings to make sure new content gets added regularly. I've had a lot going on in my professional life that has kept me busy and some negative stuff happen in the collecting game. I got full time hours whick took away some of my extra time, and while I'm glad that I have a little more money to spend on collecting, it did cut into the time I spent doing research. I've also gotten more involved in my union local as a shop steward, and the meetings, conferences, and educational opportunities are all done on my personal time which leaves less for hobbies. This is very important where I work and engaging with coworkers and fighting workplace apathy as well as other issues can be time consuming but rewarding. The negative stuff has blown over and is improving slowly. The big issue was the Microsoft Access database that I created to organize my collection suffered a catastrophic failure that took all my reports and other parts with it. 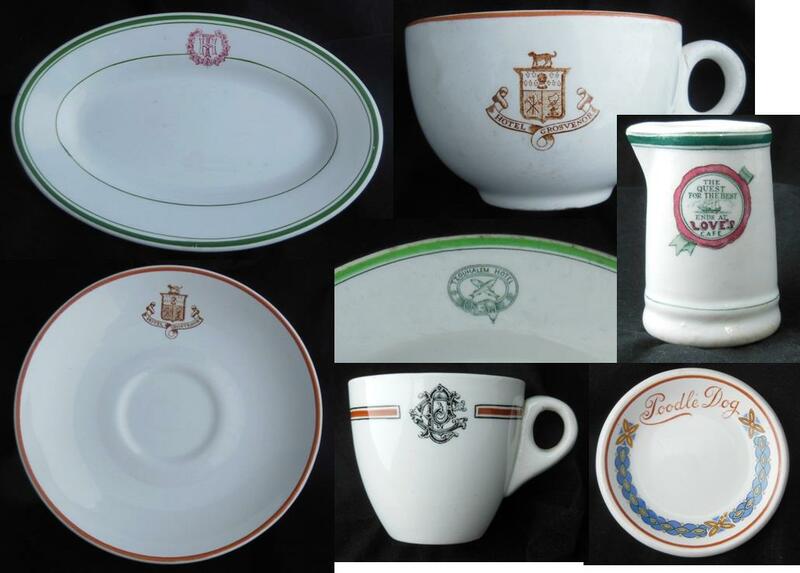 I had images of each piece of hotelware linked to it, rather than embedded so it saves on space. However, I realized after it crashed that it was acting as if the images actually were embedded which caused the size of the database to balloon to 2 GB which is the maximum size an Access database can be. It crashed and corrupted but I managed to save the raw data tables that I made. I was so angry that it happened that I didn't look at it for months. I finally turned my attention to it and in the last few days I've made it better than ever and now I can search by business name, distributor, manufacturer or shape. I hesitate to even mention this because what happened has been resolved and in the past, but it seems that there is an antique collectors "grapevine" amonst the collectors of British Columbiana (if thats not a term, I'm coining it!) of which my hotelware and steamship china falls within. Since I'm out in the Fraser Valley, and don't often have in person contact I am the last to hear anything, if I hear it at all. In conversation, a couple people were alluding to something. When I learned some details that finally made me put two and two together, I was absolutely choked and felt that my honour had been impugned. But I moved past it and it was eventually ironed out. Again, its been resolved but it really shook my confidence in what I was doing in sharing my collection like this in a public forum. But things are looking up again! I wrote an article about a hotel in Nanaimo which was published in my antique club's newsletter, I've made some neat finds and the database is working like I envisioned it. Please look out for new postings in the near future. It always seems like I don't find anything, but when I reflect back on the past few months, I realize that I have found a decent amount of stuff. While there are a few "new to me" pieces in my collection, the majority of the new acquisitions are different shapes in patterns that I already know that were too good of a deal to pass up. Some of these were found on eBay, some are from a show that I attended, and one I actually found at a local thrift store! I've set some links for you to follow for more information. 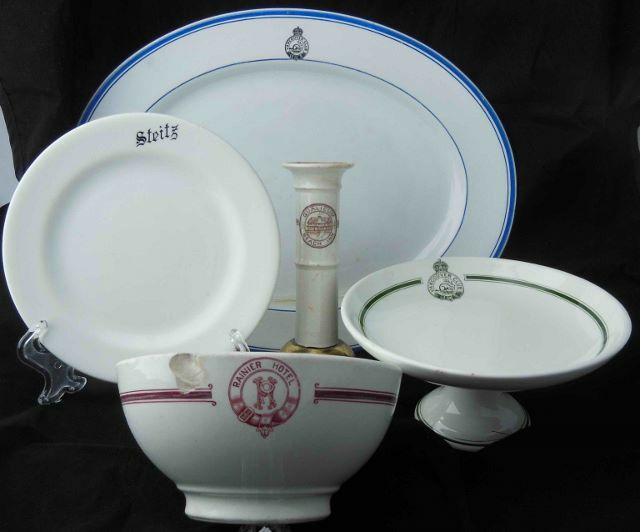 (from top to bottom) Vancouver Club platter, Steitz restaurant side plate, Qualicum Beach Inn candlestick, Vancouver Club Compote, Rainier Hotel bowl. Vancouver Club: Exclusive club located in downtown Vancouver that has been in operation since 1889. Steitz Restaurant: A restaurant that used to operate in Victoria, BC. Qualicum Beach Inn: Pretty self explanatory, the inn used to be in Qualicum Beach. 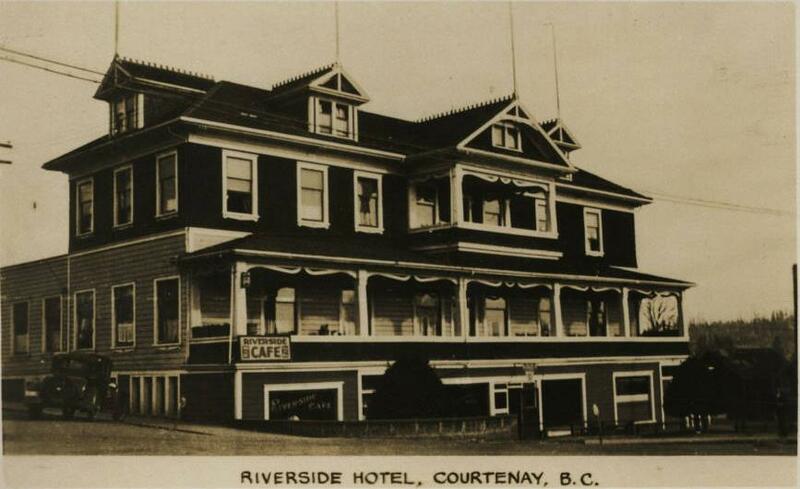 In actuality, it was known as the Qualicum Beach Hotel, and was a major golf course resort at the turn of the century! Rainier Hotel: Some people feel that the hotelware is from the Rainier that was in Nanaimo, but my feeling is that its from the Rainier in downtown Vancouver. (from top to bottom) TH small platter, Hotel Grosvenor Cup and Saucer, Tzouhalem Hotel dinner plate, Love's Cafe creamer, CP demitasse cup, Poodle Dog Cafe butterpat. TH platter: I found this platter at the MCC thrift store in Abbotsford, coincidentally a few hours after I was emailed and asked to identify the same item! I have no idea where its from, and the back stamp doesn't indicate it either. Hotel Grosvenor Cup and Saucer: These two I bought the same day but at different locations. The cup was from an antique show in New Westminster, and the saucer was from the Fort Langley Antique Mall. Both are by John Maddock & sons. 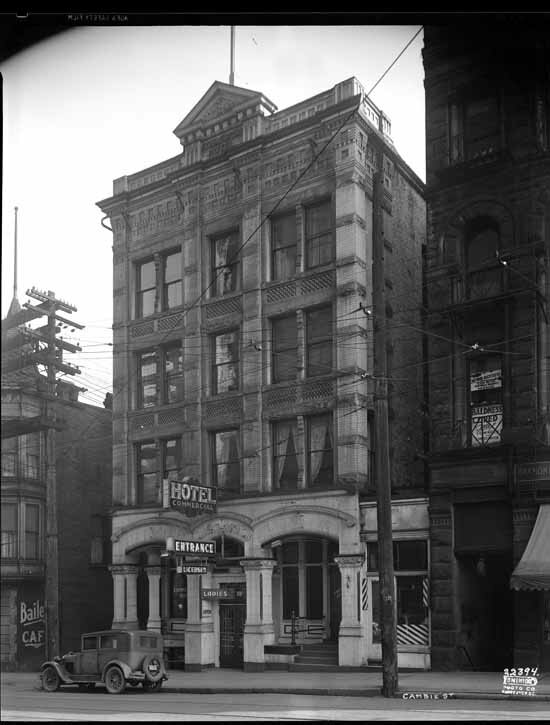 The hotel was located in downtown Vancouver. Tzouhalem Hotel dinner plate: I bought this plate from a dealer at one of the antique shows at the Croatian Cultural Centre. I've been looking for this piece for a very long time, and was always told by Vancouver Island dealers that there was a waiting list for people who wanted to buy them! Unfortunately, it has a crack in it. Love's Cafe: I got this creamer on eBay. I keep a US post office box for cheaper shipping, and this was driven across the border from the Okanagan, shipped through the states, and then I brought it back! CP demitasse cup: I found this demitasse in a military antique store in Victoria, BC and I purchased it because it seems to pop up regularly in the area, and the Royal BC Museum has a platter in their collection. Poodle Dog butter pat: The Poodle Dog Cafe started out in Victoria as a hotel and restaurant, and later was rebuilt as the large Metropole hotel. Dishware from the Metropole is of the exact same pattern, and the Poodle Dog operated as a separate business within the hotel building. 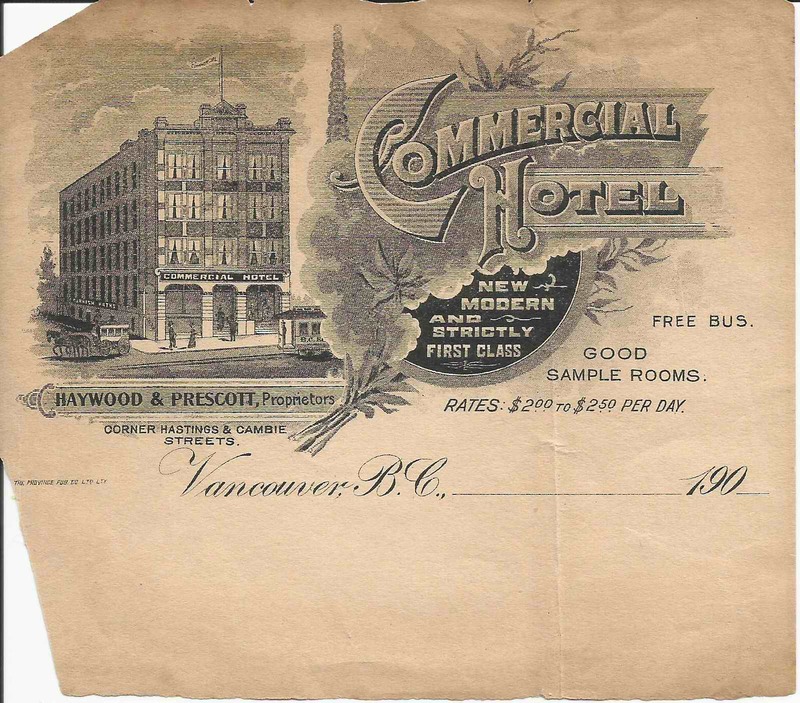 This image is tentatively attributed to 1895 by the Vancouver Archives, though I believe that it dates to two years later, when I first found records of the hotel being advertised. 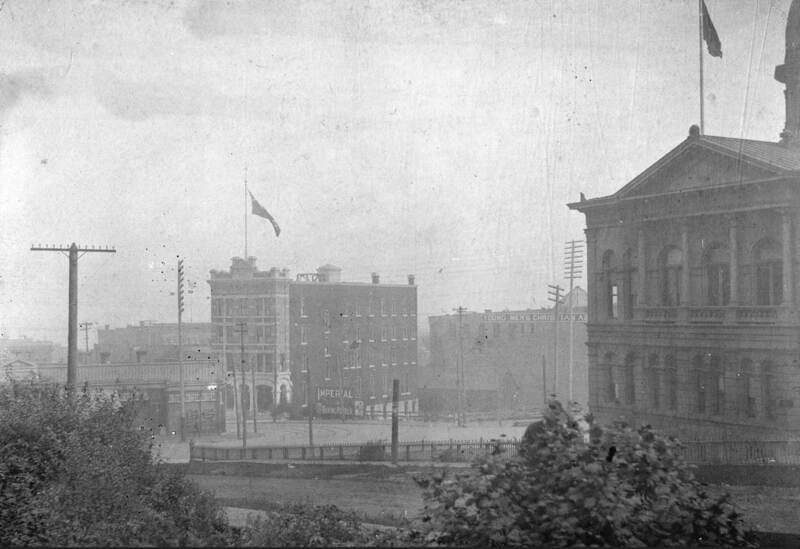 It was taken from beside the Vancouver Courthouse (now the site of Victory Square) and shows the building in its full, original glory. It stands regally with its intact pediment and flagpole, without its neighbour the Flack Block, which would be constructed in 1899. This shot was taken in 1938, and shows how the facade has been altered to accomodate a ladies entrance. The tall windows are still framed by elegant drapes, and the front of the hotel is still unobscured by the large awning that appears in Herzog's aforementioned image, and its current state. Note the barber shop in the tiny space between the hotel and the Flack Block. The neighbouring Bailey Cafe still has the cupola atop the corner of the building as well. 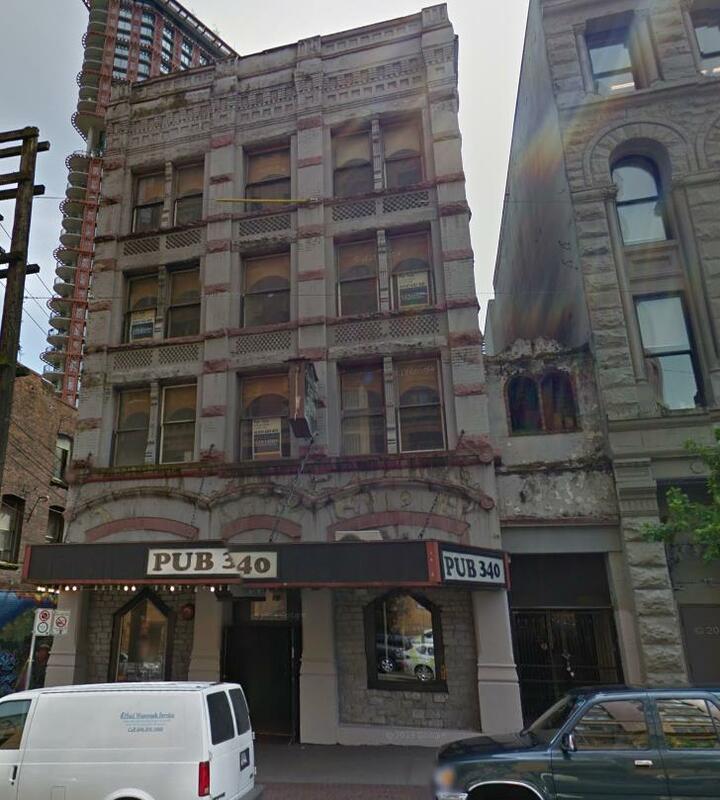 This Google street view image was taken in 2012 and demonstrates how the front was butchered in the 1970s when it was renovated with a Spanish theme and called the "El Cid Hotel" The original entrance on the right has been bricked up, shrinking the windows, and the upstairs rooms show evidence of rounded arches. Note the new Woodwards development in the background. This somewhat blurry image shows a close up of the original logo found on china from the hotel, and is reminiscent of the economy of the time. 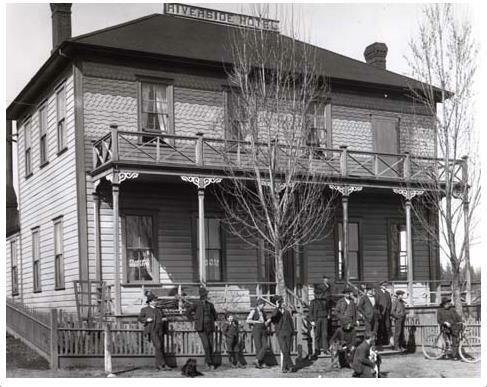 The hotel is located close to the CPR station, and was built to accomodate travellers, and later those who worked in the resource sectors, like mining and logging. While its difficult to make out in this image, there is also some tall trees and a small cabin with animals. The imagery from the logo is also reminiscent of this staged photo of logging near Denman Street by English Bay. Men and dogs are posed near a low cabin with a background of tall trees. When the Commercial Hotel was built, most of the downtown peninsula was already cleared, but development was just starting to creep to other areas off the current downtown area. These three ads from the Victoria newspaper, The British Colonist, were printed in (from top to bottom ) 1897, 1898, and 1907. This spring, in about a two week timespan, I was lucky enough to snag three butterpats on Ebay, all from sellers in the United States. This was the first time I've ever added a butterpat to my collection, and it must have been either luck or divine intervention that allowed me to find them. All three are from businesses that are already represented in my collection. I previously got a Commercial Hotel creamer a year or so ago, and I have a variety of Hotel Cranbrook ones, but the Leonard's Cafe butterpat is a new pattern for me. I've so far found three different patterns which feature a dog on them, but in all my research attempts into the owners of the business, I've not been able to figure out why a dog would feature so prominantly on their dishware. I thought that I composed a separate entry for the Commercial Hotel already, but I guess not! Look for it in the next week or so. Near the end of last year, I was fortunate enough to be given the opportunity to take a week long class in Nanaimo as part of my union education. I decided to take the opportunity to drive down to Victoria to spend a few days visiting some of my favourite stores and museums. Since it was also one of the few times I ever have a car with me when I'm on the island, it made it much easier to get around. After my week in Nanaimo, and the slow drive to Victoria (stopping along the way to visit some antique and thrift shops), I found myself in Oak Bay at a consignment store. Sitting up on a shelf was a CNR sauce boat! This is an interesting find, and only $12! Its notable because this was a pattern that is called "Algonquin" and was used first with the Canadian Northern Railway, and then the Canadian National Railway which was formed after the bankrupt Canadian Northern was nationalized by the Canadian government in 1918, and ordered to manage the federally owned Canadian Government Railways. Canadian Northern officially ceased to exist in 1923, when Canadian Northern and Canadian Government were formally merged into the Canadian National Railway. I also own an individual sauce boat of this pattern made by Limoges that I can positively attribute to the company during the Canadian Northern days, but this sauce boat doesn't have a date mark, and the manufacturers mark was used for a long period of time, making a specific date impossible to determine at this time. plate is readily identified, but the EH plate is still a mystery. I found the two plates at the same silver shop on Fort Street in downtown Victoria. I was surprised and delighted because while I already had a soup plate of the same pattern as the Levy's Restaurant plate, the EH plate was a new one for my collection. I knew of the pattern before, as I had seen it in the collection of the Royal BC Museum, and I know definitively that its a BC piece because of the Frederick Buscombe mark on the reverse, but its positive identification has so far eluded me. The date mark was marred during the manufacturing process, and all I know is that it was made during the reign of King George V (1910 - 1936). I thought it could be from the Hotel Europe in Vancouver, and it was suggested to me that it could be from the Hotel Empress (downtown Vancouver, not the one in Victoria) but hard evidence hasn't been located yet. I'll keep searching, but if anyone has proof of where it was used, please let me know! Its been a some time since I've posted, and its time for a big update! Things have been a bit slow in coming in regards to new items for my collection. In the fall, I did a road trip out to Calgary and back and managed to pick up two pieces. The businesses they are from are already represented in my collection, but when you drive all that way, you want to bring SOMETHING back! My road trip included visiting some fellow collectors, and seeing what is possible to find out there. My first stop was the North Okanagan/Shuswap region. I drove up to my parents' cottage after a day at work and stayed there overnight because I made arrangements to visit with a collector in the Shuswap/North Okanagan area the next afternoon. I have a route that I like to travel to hit some of my favourite stores, and to catch up with the shop owners. After doing some visiting at an antique store in Pritchard, it was time to get to my main appointment. I am very grateful to this collector for taking the time to show my a portion of his vast collection. I saw many beautiful pieces of hotelware that I was wholly unfamiliar with, and one that was so rare that I had only seen shards of before! This collection took many years to build, and much of it was inherited from the collector's father and was put together during a time where it was a lot easier to find hotelware, and the popularity of collecting it hadn't exploded. I took my time getting to Calgary because there was an antique show that I wanted to stop at in Vernon. It was there that I picked up the first piece of hotelware. Its an oval bowl from the Grand Forks Hotel, with green decorations and a garland around the rim. I didn't yet have an intact piece of this pattern, so I was very glad to get it! I spent a cold night in Revelstoke in a cabin at the local KOA Campground, and reached Calgary the next afternoon. It was great to visit my friend and to explore the thrift stores and antique shops that Calgary had to offer, the few that there were. There isn't really a culture of reuse there, and the few thrift stores that there are have very high prices. There are more thrift stores in my hometown of Abbotsford than I think there are in all of Calgary. We did do a day trip to Nanton, AB which is known for its antique stores. Thats where I picked up the overpriced Hotel Irving small platter. The only reason I bought it was to bring it back to the province it belongs in! After a few days in Calgary, I came back to BC through the Crowsnest Pass on HWY 3, and spent the night camping at Fort Steele. It was the low season for tourists so when I went to visit the town, I was able to get a tour all to myself! I also spent a good few hours at the Canadian Museum of Rail Travel, which I highly recommend. The next day found me in Nelson, where I met with another collector. He also had some great pieces of hotelware, but oddly enough, I found his collection of ephemera from the hotels a lot more interesting. 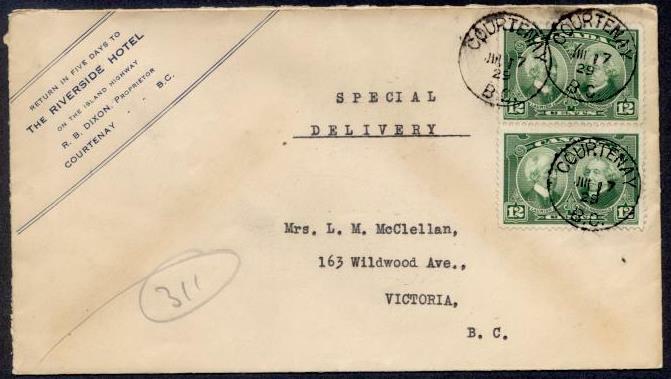 Things like envelopes and letterhead from these businesses help me to pinpoint the exact location of a hotel if it has a generic name, and this collector had some beautiful pieces. After seeing the sights of Nelson and soaking in the Ainsworth Hot Springs for a few hours, I drove out of town, and spent my last night in Osoyoos, and from there made my way home. The purpose of the trip wasn't hotelware, but to visit my friend so I wasn't disappointed when I didn't come home with very much. Though I wish I could have gone in the summer because it was mighty cold for tenting! There is a new antique show on Vancouver Island in Duncan! Well, I think that this was its second year, but I had such good luck shopping there the first time that I thought I would give it another shot. Like last time, I drove myself to the Horseshoe Bay ferry terminal and walked across and rented a car. However, when I got to the rental agency, I found that I had been upgraded from a mid-size sedan to an Ford Flex. It was easily the nicest car I've ever driven. It was a little odd to get used to at first, but I quickly got the hang of it. Though all the extra space for storage did me in at the end! I got to the Island early in the day to visit some of the antique stores in the local area, as well as the thrift shops. The thrift stores are hit and miss, as always, but I picked up a plain restaurantware mug for a quarter at a shop in Ladysmith. I had to keep reminding myself during my shopping excursion that despite having a large vehicle, I would be carrying everything onto the ferry on my own. My next stop was Chemainus, where I purchased a Canadian Pacific BCCSS mug and saucer. Though they were sold as a set, they are not intended to go together. I also found some new couch cushions at another store, made from vintage-style fabric. However, the only bags that they had to accomodate pillows of that size were some draw string kitchen trash bags! So at the end of the day, when I was frantically piling my acquisitions into the cab for the mad dash from the rental agency back to the ferry terminal, I was carrying around what appeared to be two bags of trash! Plus, since I couldn't check them, I couldn't get anything to eat because it would have been impossible to balance a tray of food with two bags plus a backpack. Oh, and the antique show? Lots of interesting stuff, but not a single piece of hotelware that I didn't already have! This is the second creamer that I spotted online from the same seller as my St. Francis Hotel creamer, and it was only a stroke of luck (and memory!) that I bid on this creamer in the first place. I bought it because at a past collectors club meeting, a fellow collector brought in the exact creamer and a matching butterpat that he dug up at a site someplace in Vancouver. Other than that, it has no identifying marks on it, and doesn't specify what kind of business its from! Leonard's was a cafe in downtown Vancouver. 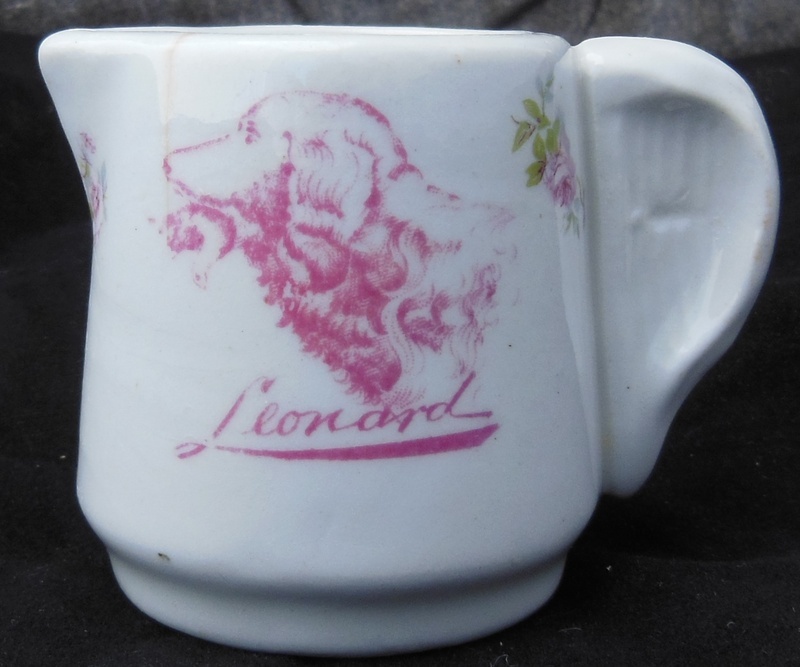 Leonard's Cafe creamer featuring a dog with a bird in it's mouth. I've been unable to find any records of why a dog would feature so prominently. This is the fourth design for this cafe that I am aware of. There isn't a lot of information available online about this business, so I've been unable to discover a lot of reliable information about it. I believe that it was first started by a man named Clayton Leonard, which I learned through extensive searching of the Vancouver Archives website. They also have some family photos of an owner in the 1930s, the Michas family, but the early years are shrouded in mystery. I also have had no luck with early city directories. What I have found seems inconclusive, unless the cafe moved to different locations over the years, or the street names have changed. I've seen references to the restaurant being near Granville and Hastings, and also being on West Pender. 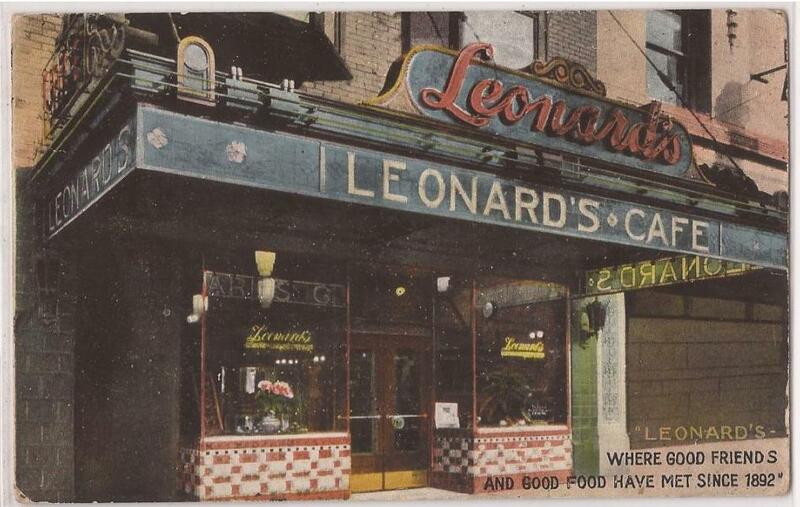 Leonard's Cafe postcard found online. The writing of the cafe name on the creamer above matches exactly to the writing on the cafe windows! 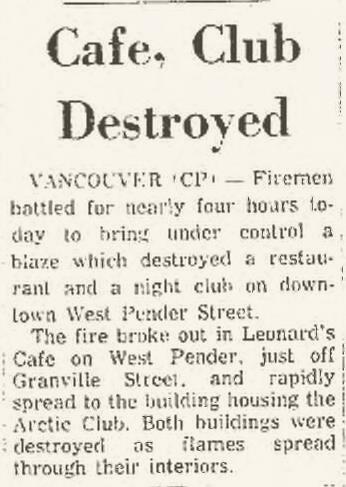 Apparently, Leonard's was also the scene of a dine-and-dash that made the papers in the 1920s. A well dressed group of eight men entered the restaurant, and had their meal. When they were finished, they cheque was brought to the cashier. The cashier was then told to send the bill to the mayor's office! 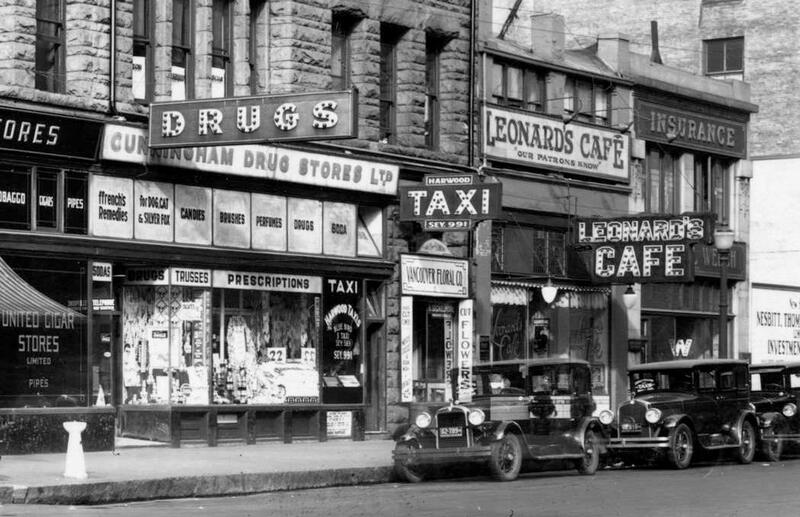 Leonard's cafe street scene in 1928, a few years after the famous dine-and-dash. The cafe must have moved sometime in the 1930's because by around 1940, it had disappeared from the block! 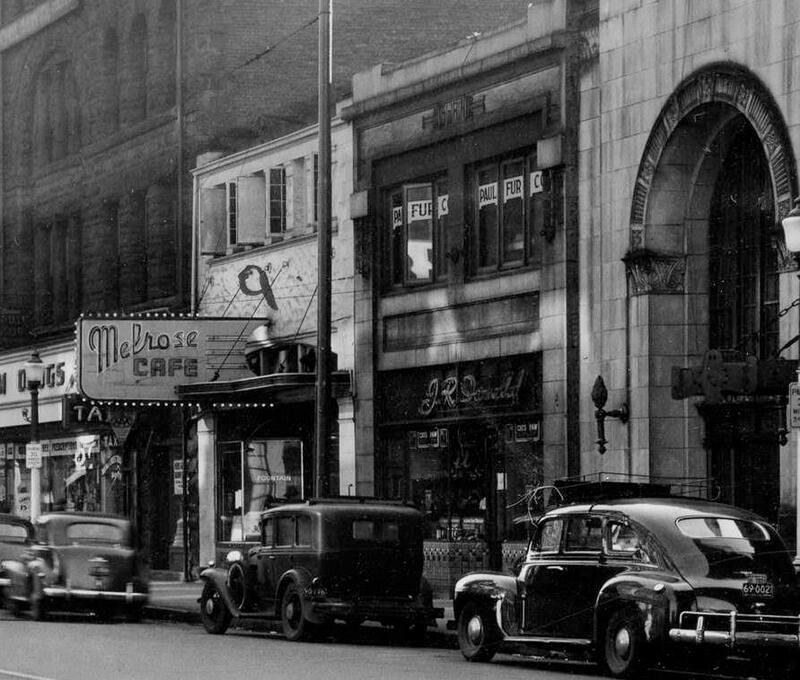 The former Leonard's Cafe location seems to have been replaced by the Melrose Cafe in this image, from around 1940. Further digging in a 1944 directory shows the cafe at 831 Granville St, no longer at its location on West Hastings. Sometime later, the cafe moved to the 700 block of West Pender, and I've been unable to find any images of its last two locations. Sadly, the cafe ended as so many others, with a fire. 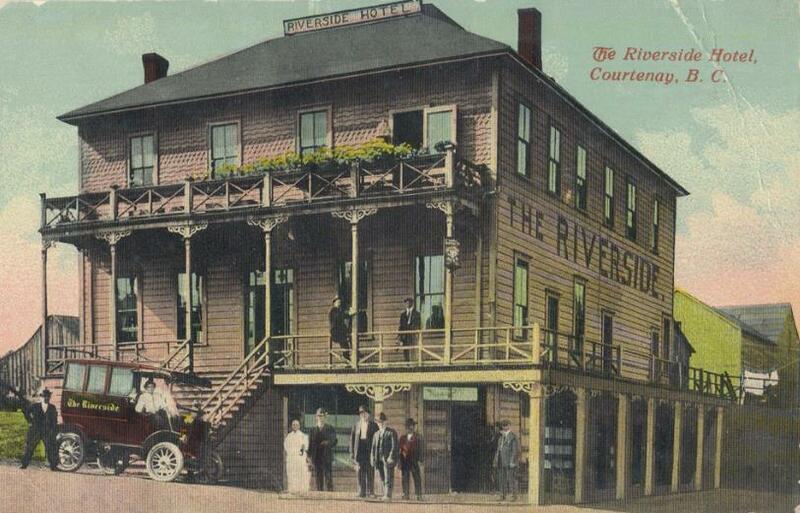 Riverside Hotel in Courtenay, B.C. This platter was the biggest find from the 2013 FVACC show. Not because it is physically the largest piece that I purchased, but because its the only one that I hadn't had heard of it before. Even the collection at the Royal BC Museum doesn't have one, but the collection there is just one person's collection that was bequeathed to it, or so I've been told. A preliminary examination was pretty self explanatory where the platter came from, and it was made by John Maddock & Sons and destributed by Frederick Buscombe & Co. Ltd.
You can see why I had no difficulty deciding that this is a BC piece. embellismentson the porch supports and the siding on the upper floor. This postcard view likely comes from the early teens, given the presence of the hotel's bus. An ad from the 1909 edition of the Vancouve Island Directory. The photograph that appeared in the ad, but much clearer! The next owner, who took over the hotel sometime in the mid-teens (the directories were inconsistent) was Otto Fechner. He had a habit of advancing money to loggers because they were only paid when they quit, rather than a regular paycheque. 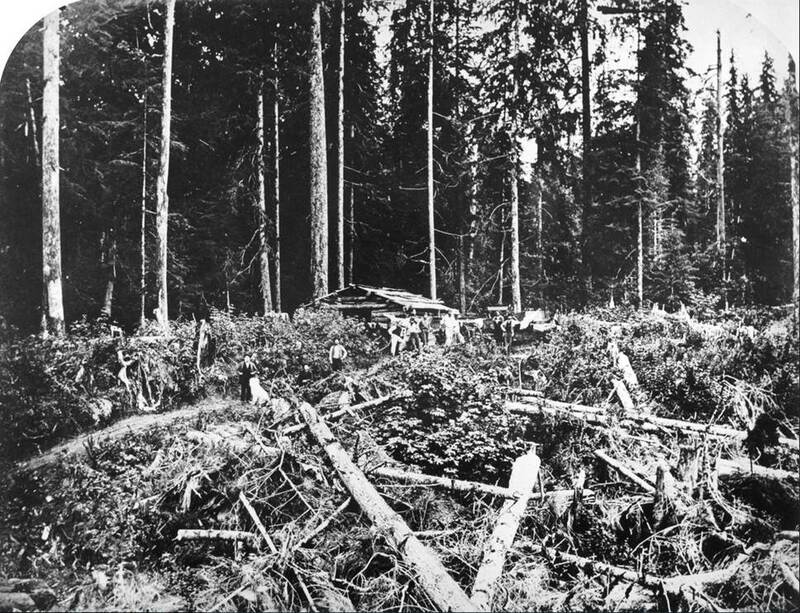 As a result of the outstanding debt, the manager of the logging company instituted monthly pay for the loggers. The first cheque that he cut was to the RIverside, and had to withould $5,000 to $6,000 to cover the outstanding debt. 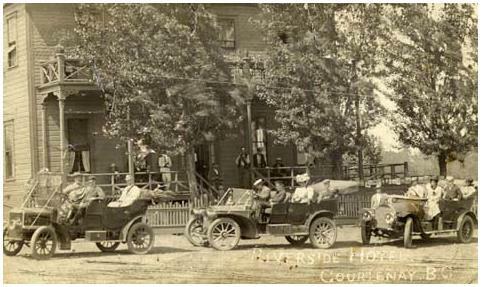 The Riverside Hotel ca. 1920. Sometime in the previos decade the hotel received an extensive renovation and expansion. The cafe was on the ground level of the hotel, along with a pub with separate entrences for women and men. 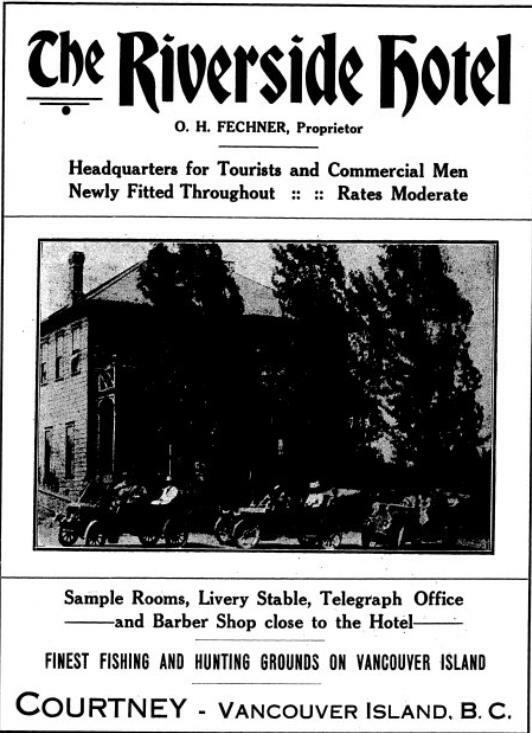 In 1920, Richard Dixon took over the hotel. An American, he worked as a donkey engineer (steam-powered winch) before 1914, and then as the engineer of the Three-Spot Locamotive. He hired his old brakeman J.N. "Buster" Brown Sr. to work as the bartender. Buster's son clamed that, "He got more in tips from the sawdust floor than wages". 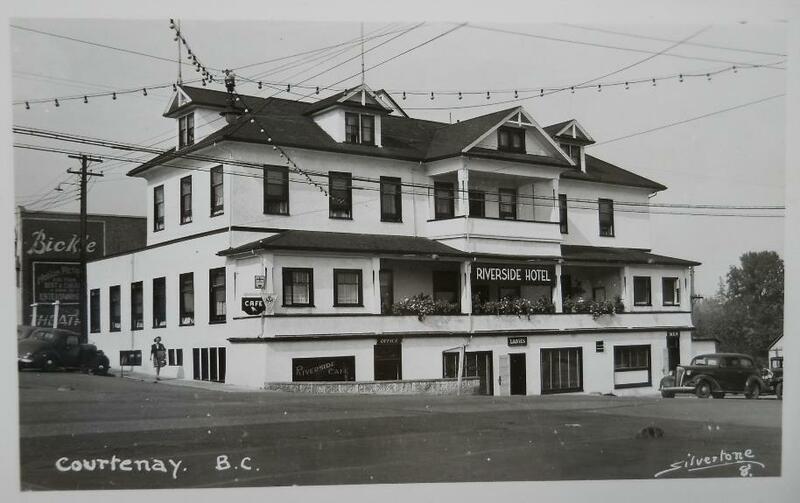 The hotel bar attracted a lot of loggers because it stood in the middle of town right next to Comox Logging's main rail line: "We'd jump off the train at Courtenay and run up to the Riverside for a beer - it was only twenty steps to the Riverside. We'd go in for a beer and come out in time to get on the last empty flatcar [of sixty]!" Hotel stationary from 1929, showing that Dixon was still the proprieter a decade after taking over the Riverside. The RIverside, likely by the late thirties or forties. At this point, it had been "modernized" with the removal of the embellishments from the front verandah, as well as having the verandah partially built in on the sides. The hotel was also covered with a layer of stucco. This postcard view makes it easier to see the separate entrances for men and women. From everything that I read, the popularity of the hotel didn't seem to have waned over time. The bar still attracted the loggers, and the curved wall in front of the building was a regular hangout for old timers. 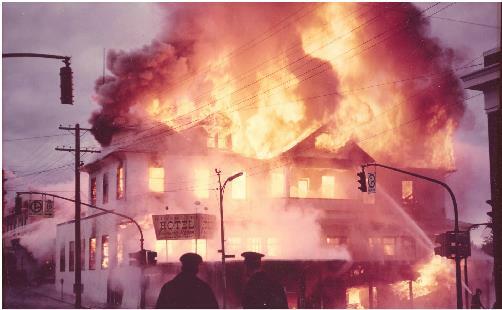 Sadly, in 1969, the hotel burned down. Mackie, R. S. (1995). The Wilderness Profound: Victorian Life on the Gulf of Georgia. Victoria: Sono Nis Press. Mackie, R. S. (2000). Island Timber. Victoria: Sono Nis Press. Mackie, R. S. (2009). Mountain Timber. Victoria: Sono Nis Press.